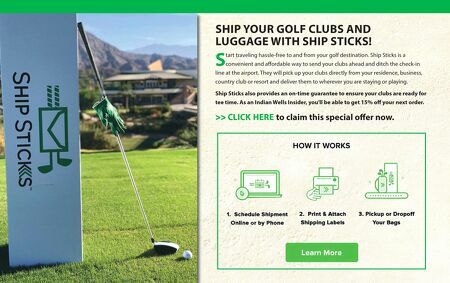 ship Your golf CluBs and luggage With ship stiCKs! s tart traveling hassle-free to and from your golf destination. Ship Sticks is a convenient and affordable way to send your clubs ahead and ditch the check-in line at the airport. They will pick up your clubs directly from your residence, business, country club or resort and deliver them to wherever you are staying or playing. ship sticks also provides an on-time guarantee to ensure your clubs are ready for tee time. as an indian Wells insider, you'll be able to get 15% off your next order. >> CliCK here to claim this special offer now.